Weber argued that the values of the protestant religion led to the emergence of Capitalism in Western Europe around the 17th century. Based on historical observation and analysis, Weber theorized this was because these were the only two countries in which Protestantism was the predominant religion, rather than Catholicism, which was the formal religion of every other European country. 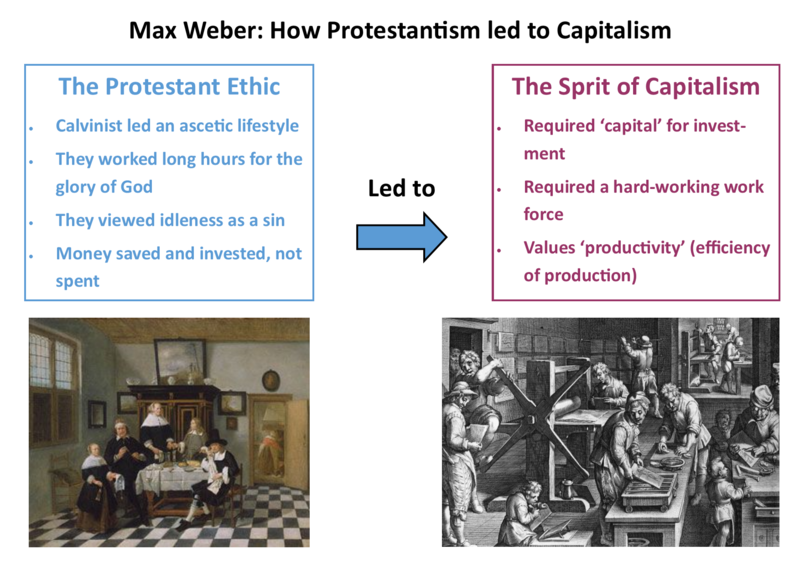 Weber theorized that the different value systems of the two religions had different effects: the values of Protestantism encouraged ways of acting which (unintentionally) resulted in capitalism emerging, over a period of many decades, even centuries. Protestantism encouraged people to ‘find God for themselves’. Protestantism taught that silent reflection, introspection and prayer were the best ways to find God. This (unintentionally, and over many years) encouraged Protestants to adopt a more ‘individualistic’ attitude to their religion by seeking their own interpretations of Christianity. In contrast, Catholicism was a religion which encouraged more conservative values and thus was resistant to such changes. The Catholic Church has a top-down structure: from God to the Pope to the Senior Bishops and then down to the people. Ultimate power to interpret Catholic doctrine lies with the Pope and his closest advisers. Practicing Catholics are expected to abide by such interpretations, they are generally not encouraged to interpret religious scripture for themselves. Similarly, part of being a good Catholic means attending mass, which is administered by a member of the Catholic establishment, which reinforces the idea that the church is in control of religious matters, rather than spirituality being a personal matter as is more the case in Protestant traditions. Part of Weber’s theory of why Capitalism first emerged in Protestant countries was that the more individualistic ethos of Protestantism laid the foundations for a greater sense of individual freedom, and the idea that it was acceptable to challenge ‘top down’ interpretations of Christian doctrine, as laid down by the clergy. Societies which have more individual freedom are more open to social changes. Weber argued that a particular denomination of Protestantism known as Calvinism played a key role in ushering in the social change of Capitalism. Calvinism preached the doctrine of predestination: God had basically already decided who was going to heaven (‘the saved) before they were born. Similarly, he had also already decided who the damned were – whether or not you were going to hell had already been decided before your birth. This fatalistic situation raised the question of how you would know who was saved and who was damned. Fortunately, Calvinism also taught that there was a way of figuring this out: there were indicators which could tell you who was more likely to be saved, and who was more likely to be damned. Simply put, the harder you worked, and the less time you spent idling and/ or engaged in unproductive, frivolous activities, then the more likely it was that you were one of those pre-chosen for a life in heaven. This is because, according to Calvinist doctrine, God valued hard-work and a ‘pure-life’ non-materialistic life. According to Weber this led to a situation in which Calvinist communities encouraged work for the glory of God, and discouraged laziness and frivolity. Needless to say there was quite a motivation to stick to these ethical codes, given that hell was the punishment if you didn’t. Over the decades, this ‘work-ethic’ encouraged individuals and whole communities to set up businesses, and re-invest any money they earned to grow these businesses (because it was a sin to spend the money you’d made on enjoying yourself), which laid the foundations for modern capitalism. On the negative side, critics have pointed out that the emergence of Capitalism doesn’t actually correlated that well with Protestantism: there are plenty of historical examples of Capitalist systems having emerged in non-Protestant countries – such as Italian Mercantilism a couple of centuries early. *Weber recongized that features of the Capitalist system were present in other parts of Europe previous to the 17th century, but Holland and England were the first societies to really adopt capitalist values at the level of society as a whole, rather than it just existing in relatively isolated pockets.